My friend and fellow blog writer Sabine asked me to write a piece about fengshui, mostly because she either laughs or shakes her head in disbelief whenever I declare that I must follow the guidelines from my fengshui expert in my living spaces. Now, there are many books and websites available about fengshui but I will attempt to be brief in this blog by relating some of my own comical yet practical tales as an interested layman. Fengshui translated into English means “wind-water.” The philosophy is that these elemental forces circulate everywhere and as such, the placement of objects and buildings in an environment determines whether energy flows in a harmonizing manner. 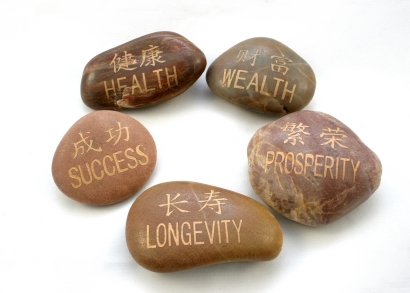 There is a less known (in the western world), more personal level to fengshui which basically involves Chinese astrology in which the fengshui master, or shifu, takes the date and time of your birth to make calculations vis-a-vis the points of the compass and the layout of your office and living environment. Individuals are “matched” to the floor plan via a superimposed geomantic chart. Don’t ask me how it works! That is why we hire these experts and if you are in a place like Hong Kong, much stock is put into following what may seem to be arbitrary dictates of the fengshui master. One of my examples involves the dictate for my daughter Arianne’s head to be facing east when she sleeps, which unsurprisingly is different from the direction recommended for my husband and me. Of course, this was based on all the calculations of every family member’s date and time of birth. When our fengshui master looked at our new apartment, he advised assigning the original master bedroom to my daughter and that we move our bedroom to the opposite end of the apartment and create a new master suite by knocking down some walls. However, I never said that it didn’t work out. Nowadays, I look back on the advice and grin because we created a suite for the adults replete with a bedroom, a sitting/media room and a study on the other side of the apartment and at the end of the day, it is a retreat away from the kid. On the other hand, we don’t entertain as much at home but then my husband tends to be a homebody. Does our fengshui master know us or is this the benefit of 20/20 hindsight? Another ongoing example is matching the head of household (sorry, but this is normally the male which is very un-PC) to the orientation of the main entrance. For my family, we need our front door to face south and yes, this was based on my husband as the head of household! When a real estate agent asked me 10 years ago if we would be interested in any properties, I pointed to a building on our street on Hong Kong Island and flatly stated that we had a deal if he could find a “C” unit in that building. On Hong Kong Island, the apartments along the Stubbs Road area, which is where we wanted to live because of its central convenience, are oriented to face the harbor for the view. This sadly wasn’t going to give us a south-facing door. Well, because it is Hong Kong, the real estate agent understood my mandate and secured me a “C” unit a few months later. This is the apartment whose master bedroom was given to my daughter as described above. I have many more anecdotes but I promised to keep this blog short. In just thinking about my experience, I did do some research while writing this blog and found a book that follows the method or school of fengshiu that I touched upon. I will be getting a copy to read. Why don’t you do too? The title is “A Master Course in Feng-Shui” by Eva Wong.